With a unique topic and front cover, Whose Knees Are These by Jabari Asim stands out as memorable children’s book. The cover shows the naked brown knees of a child walking along grass. Unlike most other board books, no faces, animals, or other identifiable objects are visible in the illustration. My baby enjoyed the bright, pastel drawings and short, rhyming text. Most of the book revolves around the knees of an unknown child. Through both text and images, readers see the knees playing, kicking, standing, and walking. Only during the last few pages do readers see a full picture of the little boy. 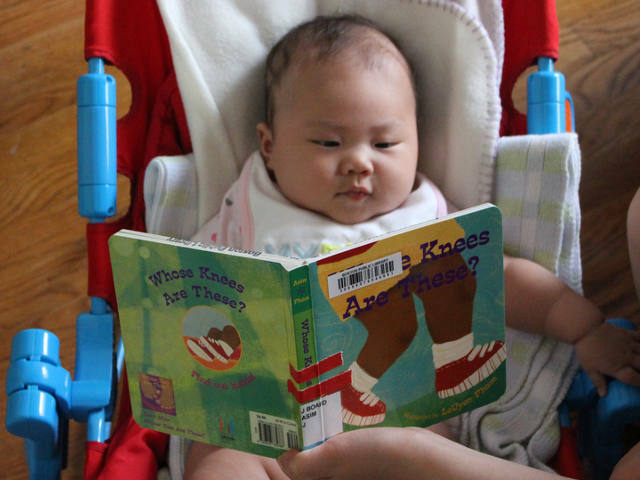 The suspense factor–of not knowing whose knees are these–will be an immediate appeal for kindergarten-age readers. Children too young to read themselves will still like learning to whom do those knees belong. For babies like my daughter, the real appeal of the book lies in the colorful pictures. On every page, the foreground, background, and even font change color. The little boy’s knees and shoes are a consistent sight drawing visual appeal. The rest of the pictures change dramatically. The story is presented in a simple rhyme with less than ten words on each pair of pages. I liked the text overall although the use of passive voice on one page makes for an awkward rhythm and more difficult sentence structure than is appropriate for the book’s intended audience. Arya enjoyed flipping the big pages of the board book and she really liked the illustrations. Her favorite page was the yellow background of the page with the tree and she seemed surprised by the vertical alignment of the last page. Jabari Asim is a current faculty member at Emerson College and author of half-a-dozen children’s books. Asim also wrote a closely related book called Whose Toes Are Those. He also writes books for adults. LeUyen Pham is a full-time illustrator in San Francisco. Her website has lists of her books as well as a gallery of her other work. She has illustrated dozens of children’s books including Asim’s related book Whose Toes Are Those. Whose Knees Are These costs (including shipping) $6.99 new or $3.99 used from Amazon.